Since 2001, Kitchen Wizards® has been helping kids of all ages to discover the magic of cooking, one bite at a time® through culinary enrichment programs. Kitchen Wizards® offers Ladies’ Night Out, community ed/Parks & Rec, corporate teambuilding events, and senior citizens workshops for adults. For children, they offer in-home cooking/baking birthday parties, scout workshops, community ed/Parks & Rec programs, summer camps, school socials/fundraisers. 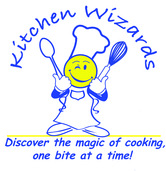 Contact them at kathy@kitchenwizards.info. Find us on Facebook (Kitchen Wizards) and Instagram (KitchenWizardKath), and see our current class schedule at www.kitchenwizards.info/events.